Happy Monday! I hope you've enjoyed your first weekend of 2014. I've been working on this project for a few weeks now and am so excited to finally be able to share it with you. 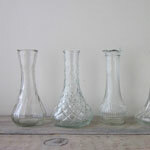 While the project itself doesn't take long to make, collecting enough of the glass bud vases took a little time. 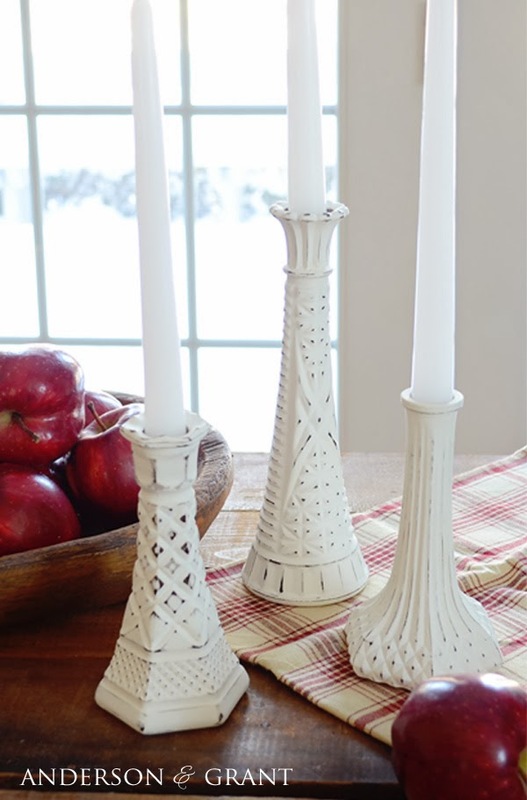 Don't these candlesticks look gorgeous, though? Do you ever wander through your local thrift store actually looking for a project? Normally I pick up random pieces with no plan and then my purchases sit boxed up in the basement. With my 2014 goal of getting things cleaned up, I've realized that I need to have a little more direction when I'm shopping. So as I browsed through my local Goodwill, I was scouting out pieces any of you should be able to find that could be repurposed into something else. One thing in large supply at any thrift store I've been to is glass vases in all different shapes, colors, and sizes. 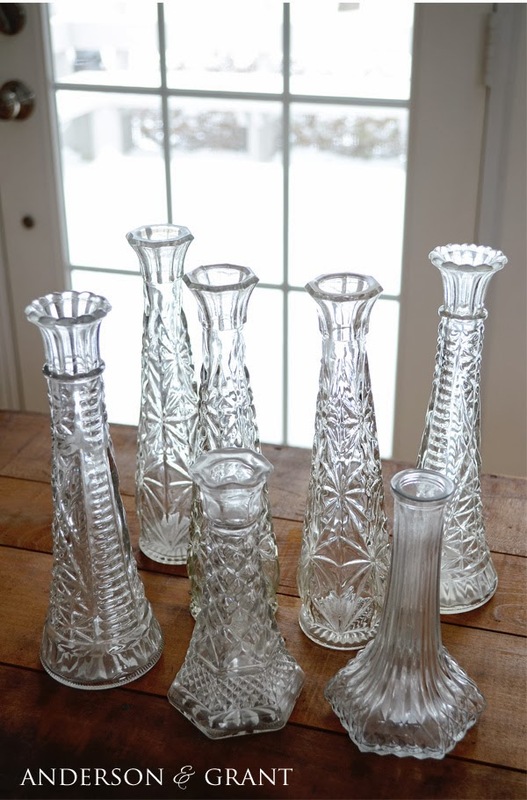 Glass bud vases are normally super cheap at around $1 a piece. My mind instantly pictured these painted, distressed, and used to hold candles rather than flowers. 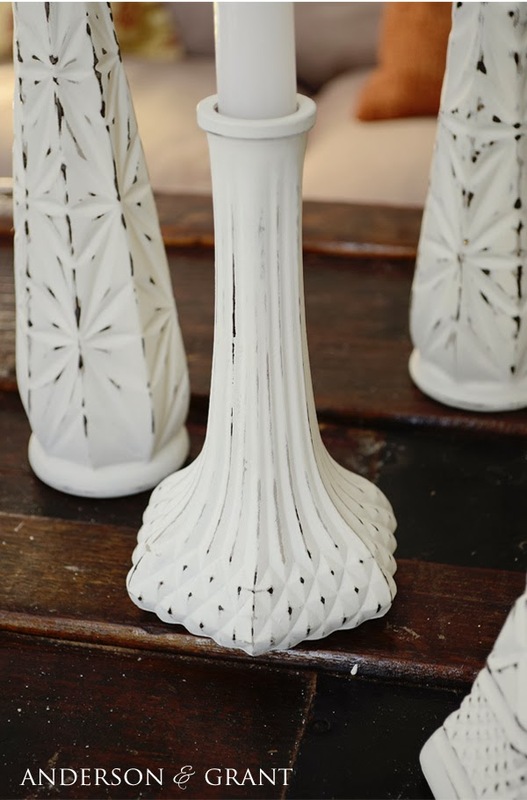 While you can buy any bud vase that you like, you just have to make sure that the top of the vase is narrow enough to hold a taper candle for this project. 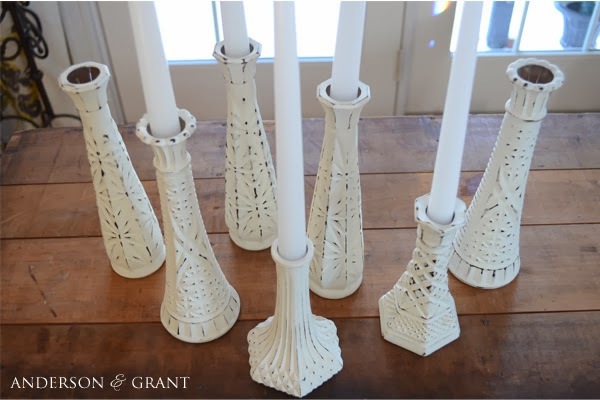 Let me show you how to recreate these unique candlesticks that I made from glass bud vases! 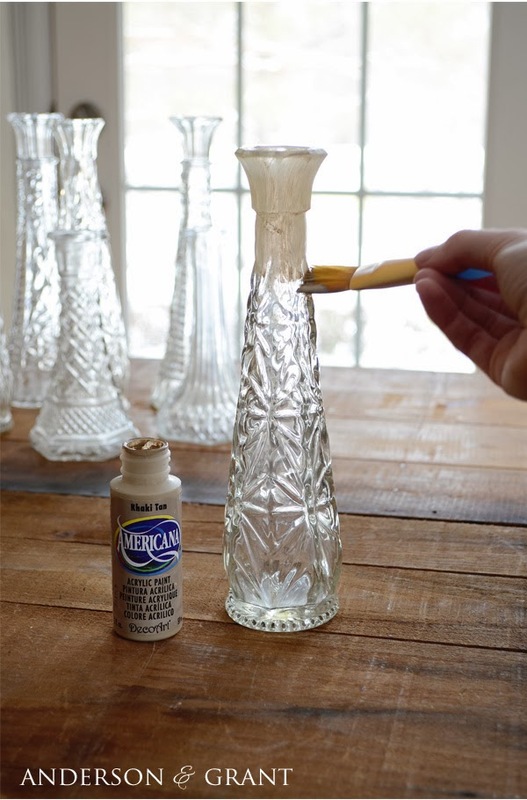 Begin by painting the outside of your vases with chalk paint. I prefer to make my own chalk paint using this recipe and adapt the ingredients based on the amount of paint I have. The great thing about chalk paint is that it sticks to just about any surface, including glass. The chalk paint also leaves a nice texture to the glass. I chose to paint the vases first with Khaki Tan (from Americana) and then Warm White. 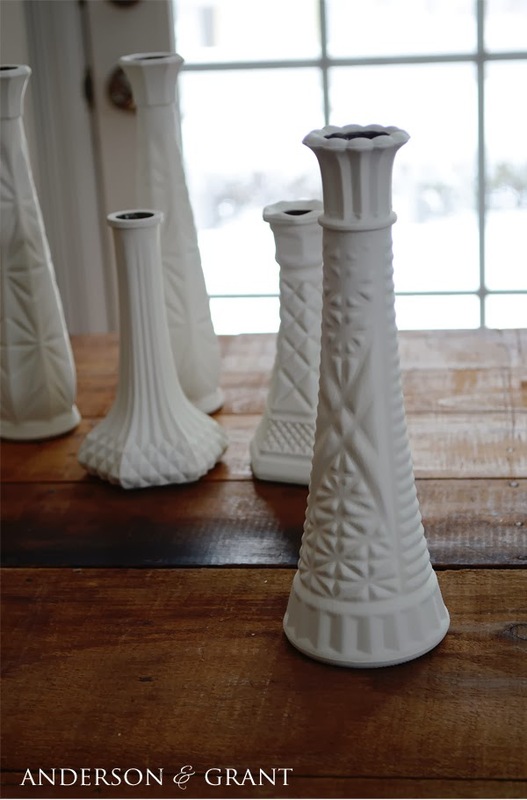 You'll need to paint three coats of each color on your vases, letting each coat dry completely before adding another. This is another reason why the project took so long! 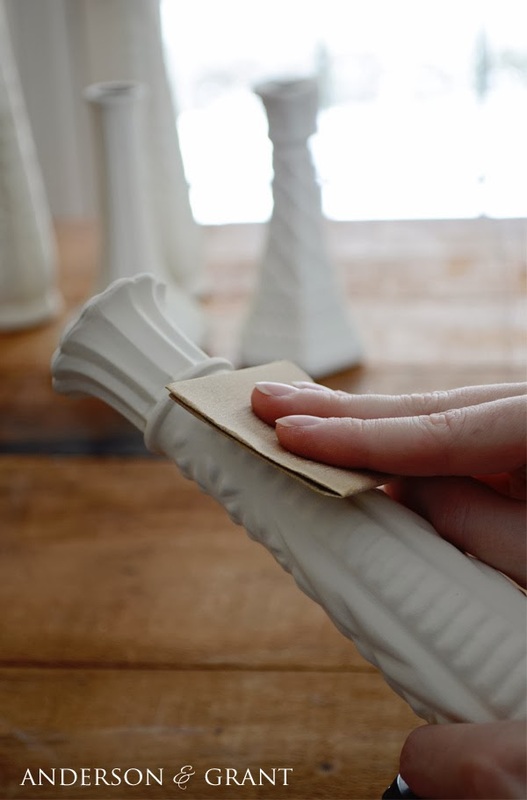 When the candlesticks are completely dry, take a nail file or fine grit sandpaper and go over the raised portions of the vase. 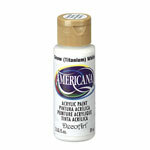 This will chip away some of the paint leaving a nice distressed finish. In some places the paint with chip away down to the glass, but in others it will leave the tan color showing through making an interesting three toned effect. 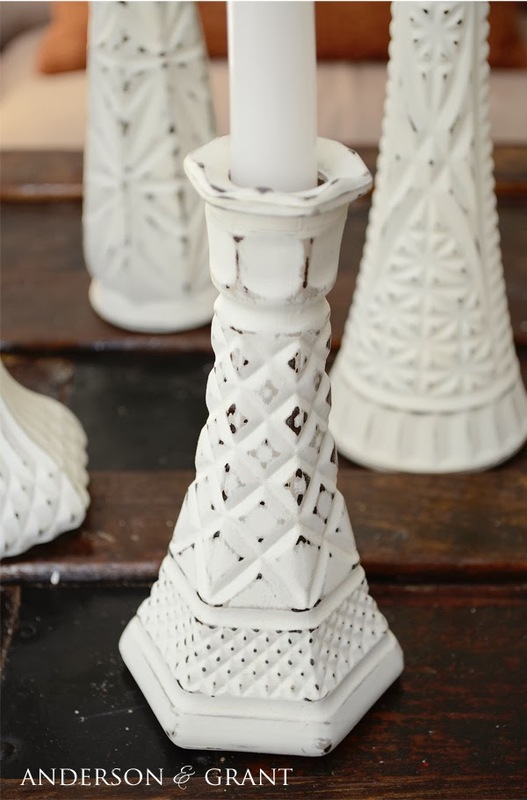 It creates just the right amount of imperfection to make the candlesticks perfect! Add some taper candles and you're done! 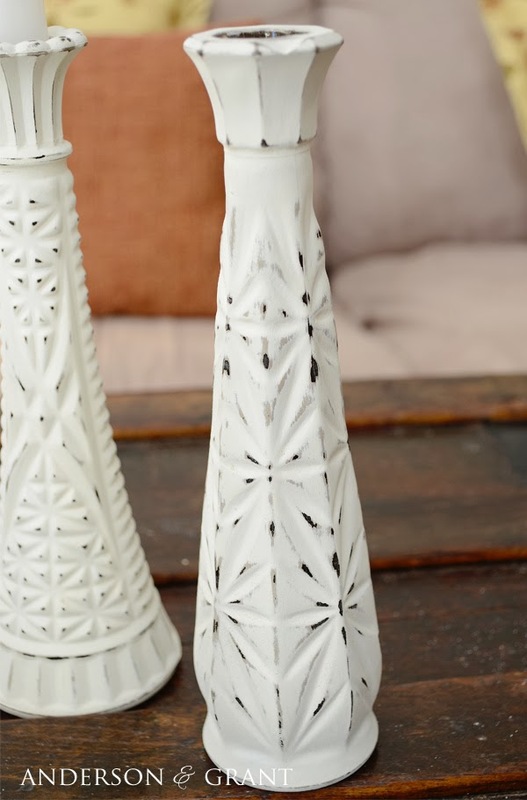 This is such a great repurposing project because the vases are so easy to find and the candlesticks can be totally customized. You can paint them whatever color you want. If you aren't into the distressed finished they can be left plain. 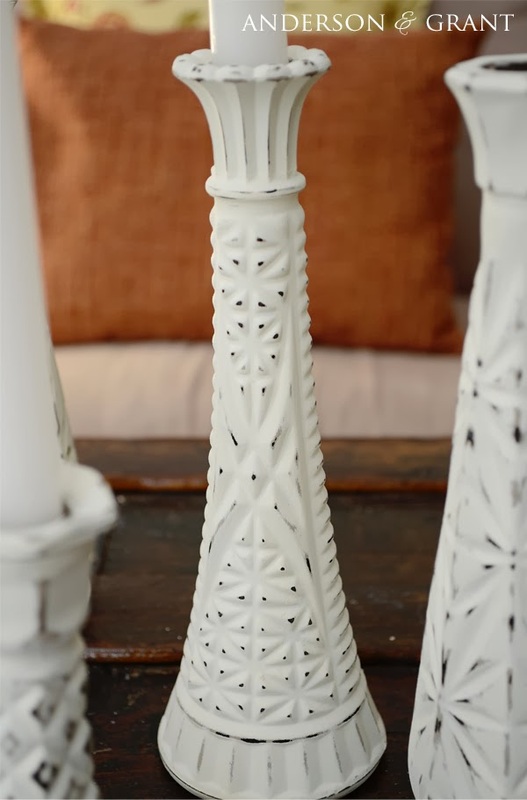 You could even turn a larger vase into a pillar candleholder if that is what you desire. 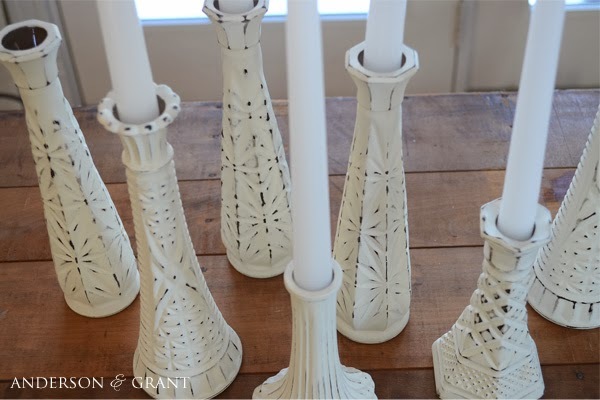 I hope this tutorial inspired you to turn some of your old vases into candlesticks. Have fun! 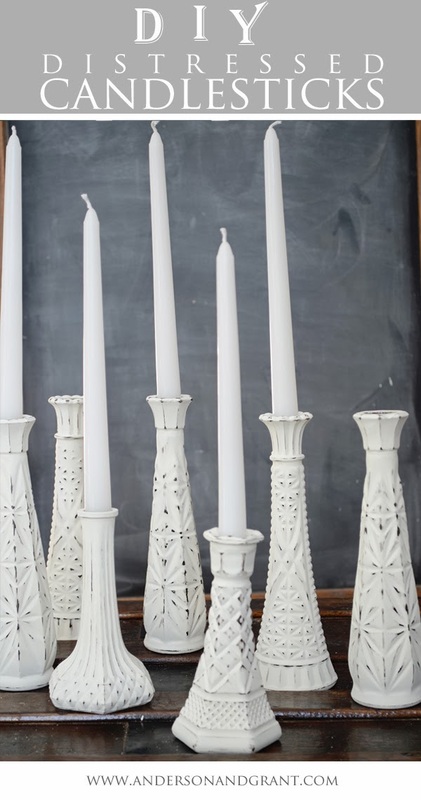 Now that you've turned some vases into a unique place to add a taper candle, check out these great tips on how to decorate with a collection of candlesticks.